A steady stream of the faithful came to St. Thomas More Parish in Elgin for confession on Be Reconciled Day, including a few who had come to the parish for the first time. Men and women patiently prayed and waited in the church before they entered the confessional. ROCKFORD—The Rockford City Council, during its regular meeting April 15, voted to send the decision on whether or not to landmark three buildings on the Cathedral of St. Peter campus back to the Codes and Regulations Committee for further review. SPRINGFIELD—It was a busy day March 20 at the State Capitol as an estimated 4,000 pro-life advocates from around Illinois gathered to lobby their elected officials and participate in an afternoon rally against bills that are moving through the House and Senate that would radically deregulate and encourage abortions in Illinois. ROCKFORD—The Rockford City Council voted April 1 to lay over the vote that would decide landmark status for the former chancery, former convent and Cathedral of St. Peter School, all located on the Cathedral of St. Peter Parish campus in West Rockford. ROCKFORD—The Catholic Women’s League Mass for Peace will be held on Wednesday, May 8, 10 a.m., at Poor Clares Corpus Christi Monastery chapel, 2111 South Main St.
Bishop David Malloy will serve as celebrant at the annual Mass where new CWL officers will be installed. Nomination of officers will be held before the Mass at 9:45 a.m.
WOODSTOCK—The annual Acies, a time for members of the Legion of Mary to renew their acts of consecration to the Blessed Mother, was held at St. Mary Parish here on March 30. DIXON—The biennial Bishop’s Luncheon hosted by the Diocesan Council of Catholic Women drew 136 women and men to the Brandywine Banquet and Event Center in Dixon on March 13. GENEVA— What’s the easiest way to connect with God? “Send Him a knee-mail,” said actor Brad Ellison, as he warmed up the 400-plus early afternoon audience attending the Cross and Light musical at St. Peter parish in Geneva on March 17. Rockford Historic Preservation Commission votes to move decision on old chancery to the City Council. ROCKFORD—The Rockford Historic Preservation Commission voted Feb. 28 to approve landmark status for the former chancery for the Diocese of Rockford, a former convent and the Cathedral of St. Peter School, all located on the Cathedral of St. Peter campus, despite strong opposition from the diocese. “Katie” has an inner joy that sparkles out, particularly when she talks about God. Her deep happiness, rooted in God’s mercy, is hard won. Now in her mid-50s, Katie continues to recover from her two abortions, the first done when she was a high school sophomore and the second when she was a high school senior. Abortions laws are in flux in the United States, ranging from a New York law that allows abortion up to delivery to a Missouri law that bans abortion when the heartbeat of an unborn child can be detected. ROCKFORD—“People want to talk with us because we have a wife (and maybe) children,” said Deacon Ignacio Felix. Landmark status of one diocesan and two parish buildings debated at Rockford commission hearing Feb. 12. Diocese plans prayer grotto for cleared space. DIOCESE—On Feb. 13, two new abortion bills were introduced in the Illinois General Assembly. They are House Bill (HB) 2467: Parent Notice Abortion- Repeal, and HB 2495: The Reproductive Health Act. DIOCESE—A vote is expected on Feb. 25 in the U.S. Senate on the Born-Alive Abortion Survivors Protection Act (S. 311/H.R 962). If passed, it would require health care providers to care for an abortion survivor as they would any newborn. ROCKFORD—Planned demolition of a former parish convent and the former diocesan chancery building, scheduled for safety reasons during the Christmas break at the Cathedral of St. Peter School, was denied by the City of Rockford just days before the buildings were to be razed. ROCKFORD—Bishop David Malloy and Cathedral of St. Peter Rector Father Stephen St. Jules announced changes and improvements to the Cathedral of St. Peter campus during an informational meeting Nov. 19. About 35 people gathered in the fellowship hall to find out about the next chapter in parish and diocesan history. ROCKFORD—The Diocese of Rockford on Nov. 14, released a list of those priests, deacons, and religious against whom a substantiated allegation of sexual abuse of a minor has been reported. 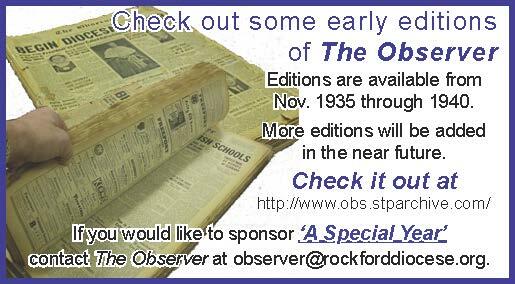 by sponsoring The Observer archive pages!